The independent donated to Democrats before he became a candidate for the U.S. Senate. Independent U.S. Senate candidate Angus King is being criticized by Republican candidates for contributing to President Obama’s re-election campaign and the Democratic National Committee. King, who has declined to say which party he will caucus with if he wins the seat in November, bought two $5,000 tickets to Obama’s fundraising dinner in Portland on Feb. 21, a week before Republican Sen. Olympia Snowe made her surprise announcement that she would not seek re-election. King’s spokeswoman, Crystal Canney, told The Portland Press Herald on Wednesday that his purchase was a single transaction payable to the Obama Victory Fund, which later divided it into two payments: $4,000 to Obama’s campaign and $6,000 to the Democratic National Committee. Canney provided a credit card statement consistent with that account. The portion of the purchase that went to the Democratic National Committee appeared with a transaction date of Feb. 29, the day after Snowe’s announcement. The transactions were reported to the Federal Election Commission. “Is it really a secret who Angus plans to caucus with in Washington?” it concluded. Bennett’s query was posted later in the day by the conservative Maine Heritage Policy Center’s Maine Wire news service. King, a former independent governor who has been on record as an Obama supporter, has actually made only $11,000 in federal political contributions during the current election cycle, according to FEC filings. In addition to the $10,000 for two tickets to Obama’s fundraising dinner, King gave $1,000 to Obama’s campaign on Sept. 29. In 2008, he made two donations to Obama totaling $1,750. 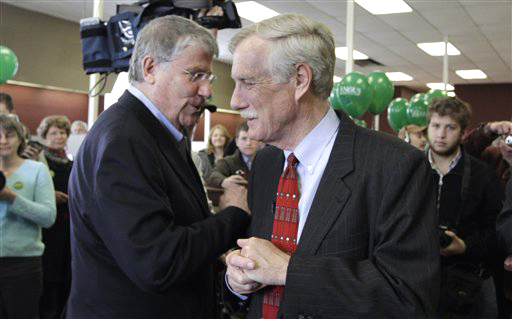 Canney said the tickets were used by King’s son, Angus King III, and daughter-in-law. Ron Schmidt, a political scientist at the University of Southern Maine, said he doubts the issue will prove problematic for King.